Spazz Fest V kicks off tonight! A celebration of DIY music in Greenville, this time of year brings waves of nostalgia for those of us who supported (and still support) a robust and diverse music scene out in the middle of eastern North Carolina. Last week, a few friends were reminiscing about this 2006 show at Spazz Haus. 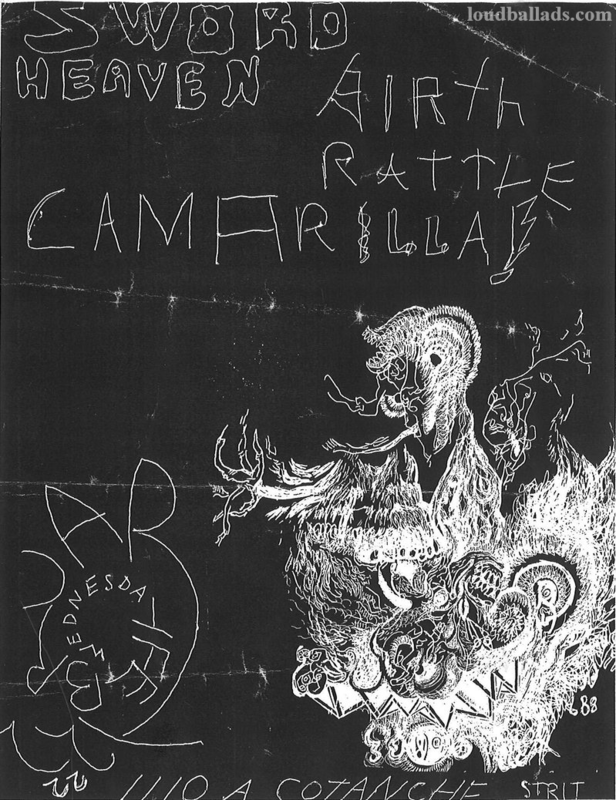 An intense night of noise, Sword Heaven (Columbus, OH) scraped skulls along with Greenville solo acts Birth Rattle and Camarilla. One of the most intense bands I’ve ever witnessed in a living room, Sword Heaven (whose influences include Swans, Sun O))) and Godflesh) was a possessed duo that can only be completely experienced by seeing live. Although not quite the same as being surrounded by sweaty bodies, you can skip the musty armpits & ringing ears and check out this clip of them playing Amsterdam in 2008. By this point, you’re probably thinking that the guys in Sword Heaven are pretty dark people. BUT, guess what? In 2009, Aaron Hibbs (drums) broke the Guinness world record for Marathon Hula Hooping by hula-ing for 75 consecutive hours. To answer the next question in your mind, he wore a catheter. You can check out his Hula Hoop Marathon site or this short interview. The other half of Sword Heaven, Mark Van Fleet, is still making music under his own name. Camarilla was the solo project of Steve Backus from Network of Terror. A wiz with the theremin, the first time he ever played one was at a showing of ‘The Day the Earth Stood Still’ in Raleigh, NC. Greenville’s own Fathers of Noise, Jim Capps and Nathan Maxwell, are still playing sets as Birth Rattle. Check out a clip of Jim playing Nightlight in 2010, or a more recent vid of him playing as part of the J.M. Borer/ C. Arthur W./ Jim Capps Trio at All Day Records’ 3rd birthday celebration.